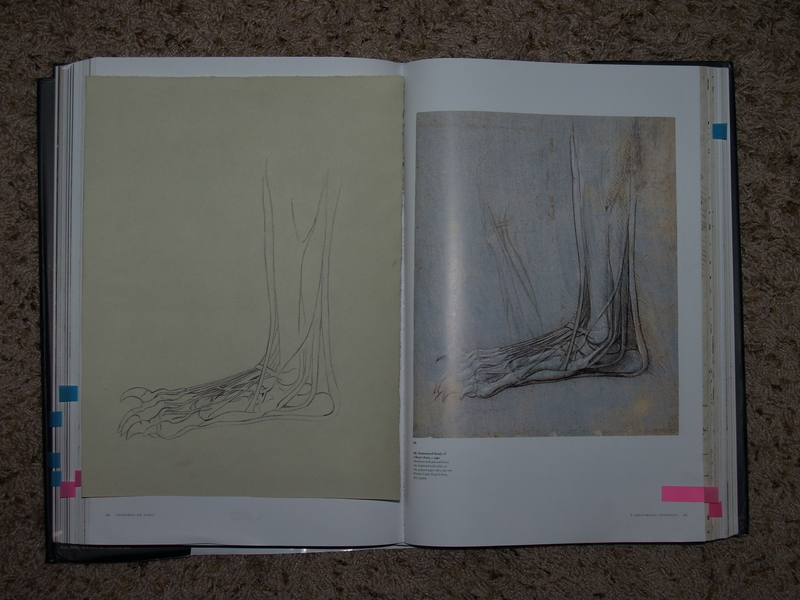 Here’s Da Vinci’s Anatomical Study of a Bear’s Foot, circa 1490, which I copied from Frank Zollner’s Leonardo Da Vinci: Complete Paintings and Drawings. First impressions: Love/awe of the machinations of a bear’s biology. Visual rhythm in the metacarpals allowed to “shine” in simple lines and contrast between dark ink and white highlighting. And the color choice did more for the drawing than a simple black and white drawing — a case of more is more. The brown showcases the blue and contrasts nicely with the white, and vice versa. These things I tried to transfer over to my copy of the drawing. Step 1: I created a carbon copy by first tracing directly from the book and then flipping it over and drawing over the lines with a lead pencil. Step 2: I went through a process of applying ink and adding highlights. But I didn’t like how this turned out, as I got over-zealous with the ink (which I did for Da Vinci’s Study of a Lily as well). Step 1: I made a carbon copy. Both carbon copies produced very blurry lines, so when the flow of a line was cut off, I had to meticulously find all the pieces making up its “flow” and connect them by eye to make sure it flowed in the same way. Step 2: I applied ink, but more gently this time, using the pen the way I did the pencil. When I saw the pen as a pen, I was very heavy-handed, and it’s a delicate drawing. So I needed to strike up a balance between the considerations for delicacy of the lines and the intensity of the contrast between the colors. The first layer of ink was too light, so I carefully added another layer, etc. Step 3: I tried to give it a little volume. I’m very new to hatching, and it shows, but the white highlights added volume in a really nice way, especially to the toe bones. Overall: It’s not exactly to my liking, but I guess that’s where I am as an artist. 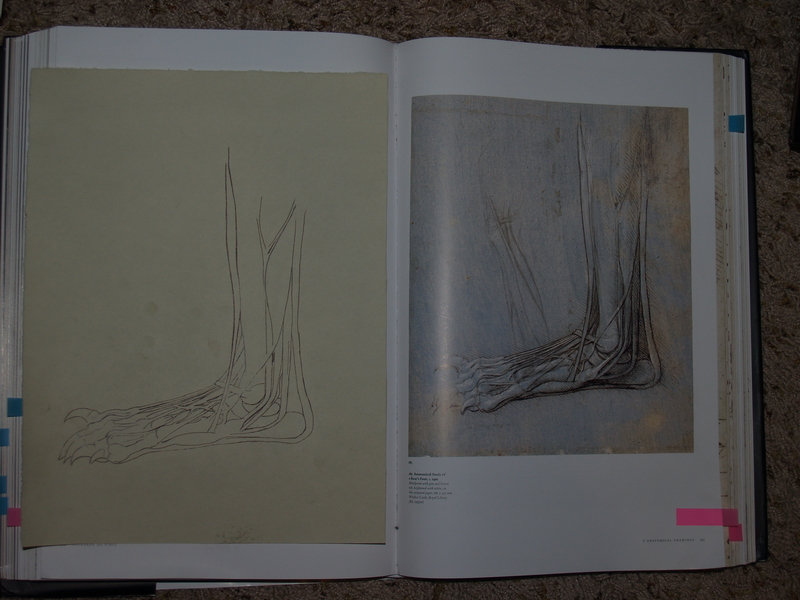 I couldn’t quite get the volume of the heel the way it was achieved in the original, and although I chose a very light blue laid paper, it wasn’t as blue as the one in the book. On the other hand, while the first copy had better contrast in some places, I like the second copy better for being a more delicate drawing. I think I’m making progress.